Are you looking at the “paper neighbors” of your relatives? The first declaration of intention shown here is for the person of interest. The one immediately after his was done on the very same day by another person with allegiance to the same country. There were no other declarations made on that day. Odd that the two men coincidentally arrived on the same day. 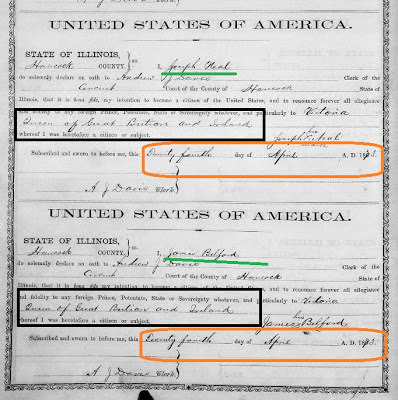 Turns out they were both connected to another family of Irish immigrants to the same area–and that was discovered by researching both men.